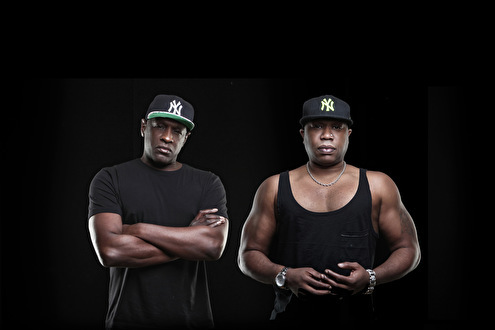 Since aligning professionally 25 years ago, Fabio & Grooverider have been at the forefront of a genre which just seems to get stronger and more 'global' year on year, with household names such as Chase & Status, Sigma and DJ Fresh smashing the top 40 to pieces. These are just a few names that received their initial exposure from the pair. The scene in general owes much to Fabio & Grooverider's dedication, focus and longevity. They were part of the very few UK DJs to first play House music, and to then fuse and formulate something entirely new which would eventually evolve into Jungle/Drum and Bass. It is no understatement to say that the respective streams and offshoots of D&B that Fabio & Grooverider both represent from those early times now stretch so wide – liquid, jump up, technical, minimal and half-time styles to name a few – that it's effectively the fabric of D&B itself. Fabio & Grooverider were voted in the top 25 of the greatest DJs of all time in a recent Mixmag poll, an achievement which is not easily won. From their first venture into pirate radio on Phase 1 a simple template was established: fuel the energy of the streets, the illegal, massively-attended raves of the late 80s – legendary raves such as Fantasia, Biology and Sunrise – instantly back to the airwaves. The early days of 'Jungle Techno' gradually became the world's first weekly Jungle night at Rage in London, where the boundaries were pushed into the red every week, so much so that the scene became notoriously hard, even intimidating. As such, Fabio channelled the kinetic soul of the music to a new outlet, Speed, alongside comrade LTJ Bukem and, in conjunction with Groove Connection, eventually lead to Swerve in the late 90s as his 'Liquid Funk' vibe grabbed hold and took flight, and the vocal element successfully ignited with the unique musicality of D&B. This happened with Fabio's firm encouragement. It resulted in major D&B chart hits such as 'Midnite' and 'Shake Ur Body', while tracks such as 'Hide U' by Kosheen set new standards within D&B, perhaps establishing style parameters which may have previously been seen as exclusive to House and Techno, and which are still in place today. All the while, Grooverider remained active and driven: with the Prototype label, with work as a producer, as 'Codename John' and with his own Grace nights. On the release front, Fabio established his Creative Source label as an outlet for the burgeoning new forms of D&B emerging week after week, and also stepped up alongside Photek for 'No Joke' on Photek Productions. 'The Prototype Years' compilation was released by Grooverider, who followed it with his own artist album: 'Mysteries of Funk'. Grooverider has released many 12s over time, including 'The Warning' as Codename John on Metalheadz. His remix of 'Charade' is simply a timeless D&B classic. Both have been involved in compilations through Drum and Bass Arena and Fabric, and in 2010, Ministry of Sound released 'Masterpiece' by the pair: a triple album. Over the years, Fabio & Grooverider's influence on new and upcoming artists is simply incalculable: key figures such as Goldie, Bailey, Matrix, John B, Calibre & many more will attest to the influence of the pair as they first entered D&B and established their own career in music, ongoing. And to achieve a play of one of your tunes by Fabio or Grooverider: It was simply a pinnacle, a sign that you'd arrived. Radio was always a natural outlet for the pair and their vocal, extrovert styles: the perfect gift for the airwaves. So, via major UK stations Kiss FM and BBC Radio One a breathtaking era of new talent and styles emerged week after week on their show over the course of a decade and a half, all owing to the deep down 'finger on the pulse' dubplate-driven culture of the pair. Names such as Chase & Status, Pendulum, Calibre, Hazard, Bad Company – featuring DJ Fresh of course – Camo & Krooked, Nero, Alix Perez, High Contrast, Drumsound and Bassline Smith, Artificial Intelligence, Dillinja, Sigma, Sub Focus, Lynx, Dub Phizix and countless more all know that their key exposure is down to the pair's organic love of D&B. Not schedulers, playlisters nor stats. Fabio & Grooverider continued as radio presenters on Ministry of Sound, and in 2014 Fabio joined Grooverider as part of the Drum and Bass Arena Hall of Fame. So, up to the present? We live in a time where on-fire, club-ready D&B from the likes of Sigma, Rudimental and DJ Fresh is heard in our local corner store in as quick succession as we hear of new D&B hotspots erupting over in the Far East. How surreal? And it all comes back to Fabio & Grooverider. Why? Fabio & Grooverider don't simply DJ. And they don't simply present radio. They are both respective auteurs and the collective embodiment of a pleasing paradox: they love the past and are impatient for the future, and this shines through. Judging by the visible evidence of the pair L.I.V.E. in 2015, it ain't gonna stop anytime soon. Ritmisch slagwerk, lage tonen en een gebroken vierkwartsmaat; dit zijn de basisingrediënten van drum & bass. In 1991 kwam deze muziekstijl op uit de Londense rave en junglescene, critici riepen destijds eensgezind dat de hype nog geen jaar zou duren. Het tegendeel is waar, anno 2016 is drum & bass nog altijd springlevend met wereldwijd een hartstochtelijke achterban. Ter ere van deze mijlpaal presenteren Fabio & Grooverider, ook wel 'The Godfathers of drum & bass' genoemd, op 23 juli in Paradiso het beste wat het genre in 25 jaar heeft voortgebracht. Met Fabio blikken we terug op de beginjaren.